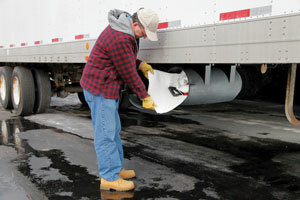 Ensure your drivers are prepared for leaks and spills at fuel islands and other spill-prone areas with the Truck-Mount Spill Kit. This durable kit mounts to a truck’s exterior to provide quick access to absorbents and other cleanup supplies. Constructed from heavy-duty, UV-resistant polyethylene, the kit includes the company’s oil-only absorbents, repair putty, a containment pool, a shovel and personal protective equipment.